All this week Xyron and BoBunny design teams are working together to share some great ideas using their products. I received BoBunny’s Trail Mix collection. 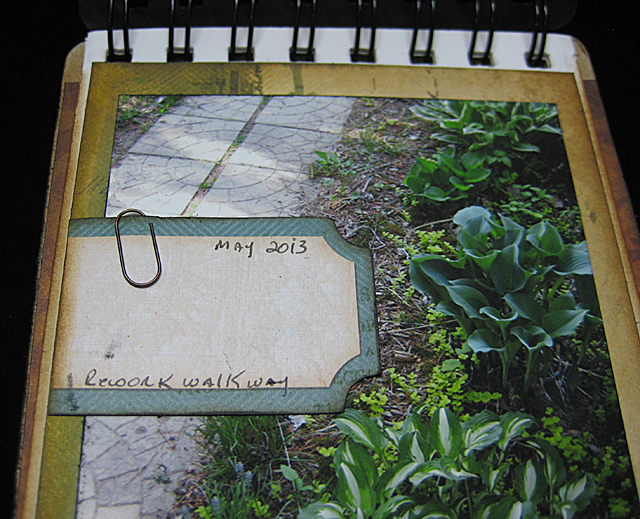 I created this little mini to document areas in my yard and garden that need some extra attention this summer. Of course, as usual, I’m about two weeks or more behind in garden work so now I have to play catch-up. But, I digress. On to the mini book. 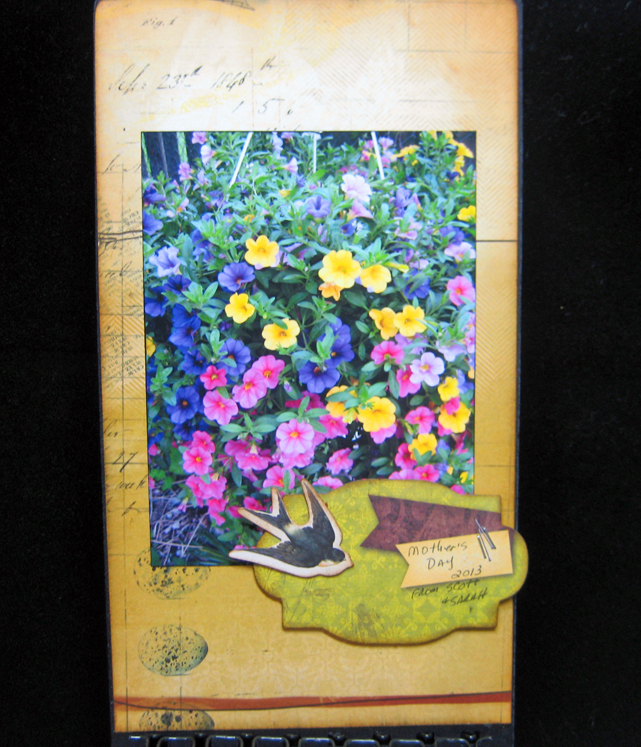 I started with a plain mini book from Basically Bare – Krafty Keepsake Vintage. This mini has four white envelope pages with flaps and a heavy-duty chipboard inner page along with two black chipboard covers. After measuring the covers, envelopes and center page I cut papers to fit each of these along with some smaller pieces to cover the envelope flaps. 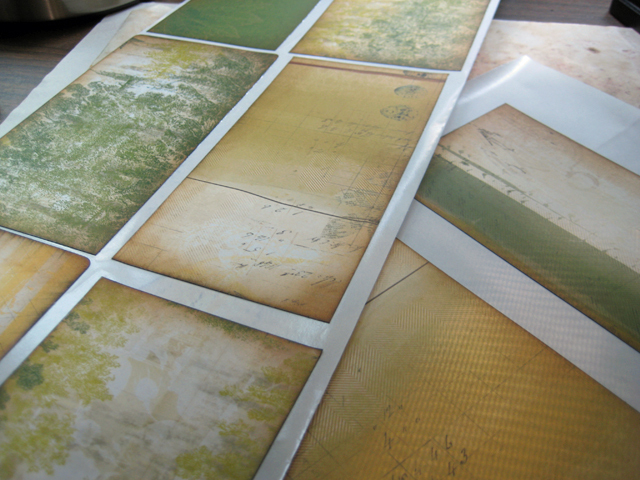 I inked all the papers with Vintage Photo Distress Ink followed up by a light edging of Black Soot Distress Ink then processed them all through the Xyron 9″ Creative Station. With full coverage of adhesive on the papers it is so quick-and-easy to put this little book together – just peel and stick! 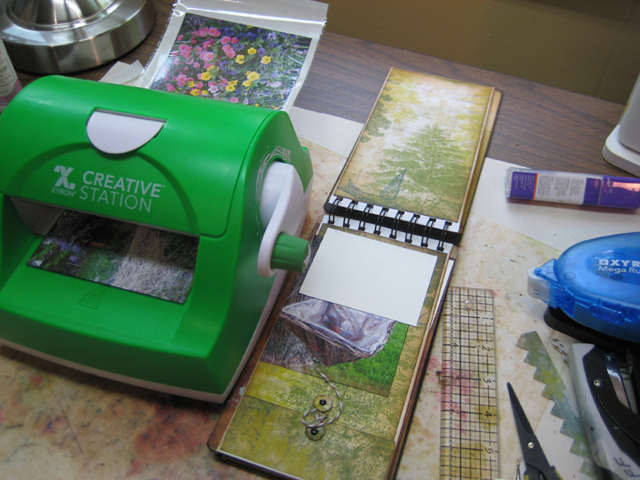 I even process my photos through my Xyron 5″ Creative Station because they stick down so very well. 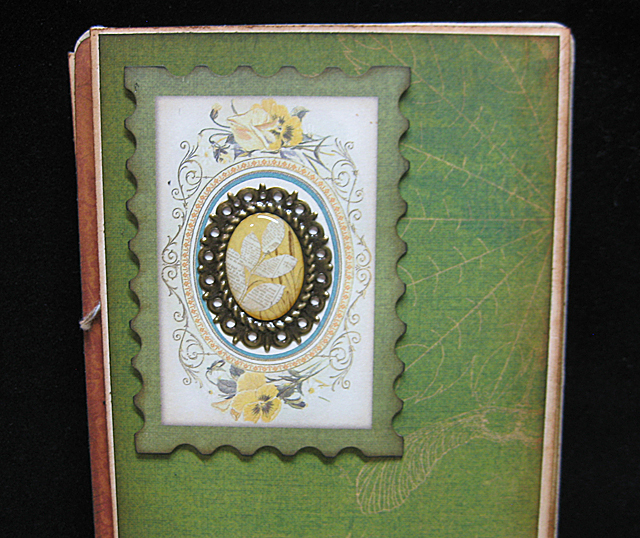 Mini books often get a lot of handling so I like to make sure my photos and papers are stuck down securely. After adhering BoBunny’s papers to the envelope flaps I made reinforcers by punching 1/2 circles, coating them Piccolo Glastique Gloss (clear-drying dimensional glue), and adhered them in place with little black brads. I added a length of Cappuccino twine from The Twinery as the closure. I intend to tuck garden notes and receipts into the envelope pages. Seems like every time I purchase garden plants with a one-year guarantee I can never find the receipt the next year if I need to return it because it didn’t survive. This way I’ll be able to access the receipt! I popped up several of the BoBunny Noteworthy die-cuts by trimming some leftover Grunge Board which I processed through the Xyron 1.5″ Create-a-Sticker, flipped over and processed again. This applies adhesive to both sides of the Grunge Board so I’ve just created my own dimensional adhesive. The flat embellishments are adhered with Xyron’s Mega Runner and Xyron’s Glue Stick. 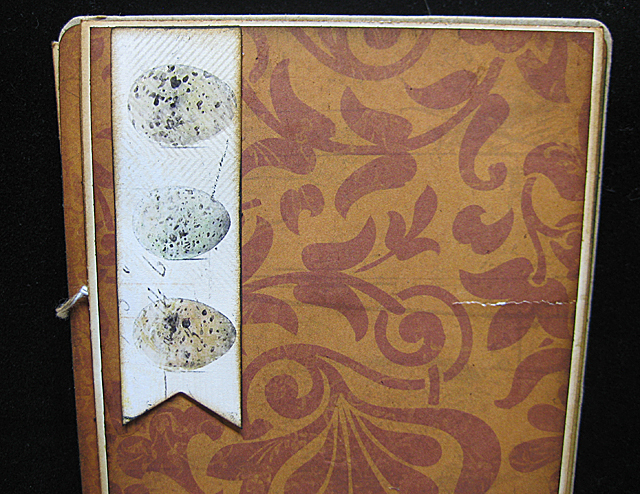 I added a dollop of Glastique to the eggs on this little tag to make them a bit dimensional. It dries in about an hour and adds a nice touch. 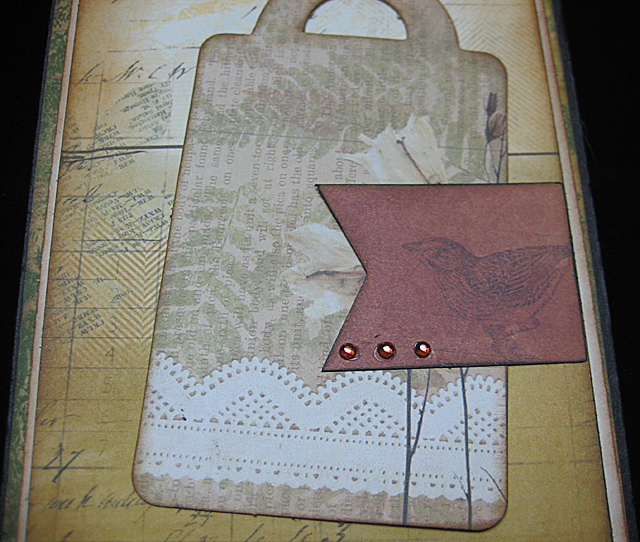 I love this large postage-stamp embellishment. I inked the edges and used Xyron’s new High Tack Adhesive Dots to adhere the metal BoBunny Trinket in the center. 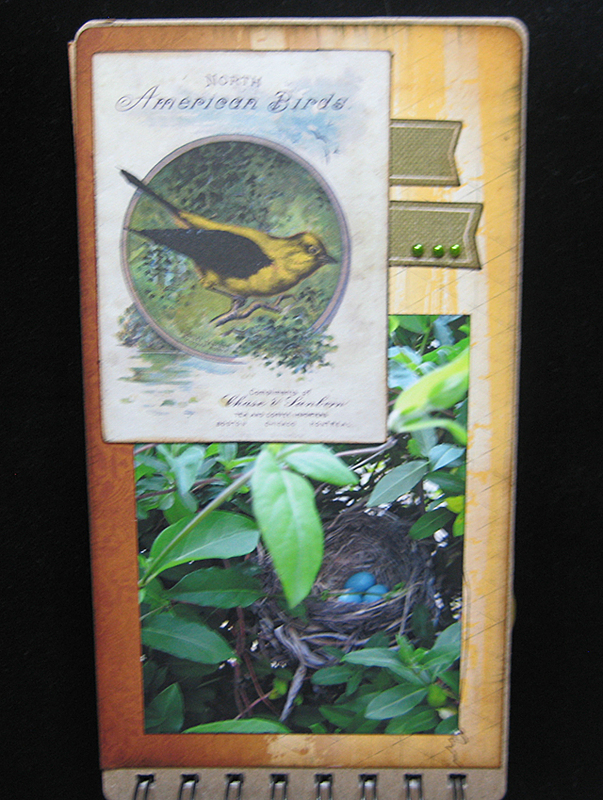 I also added the Explore Trinket to the cover with two black brads and tucked in a little bird from the Noteworthy collection. 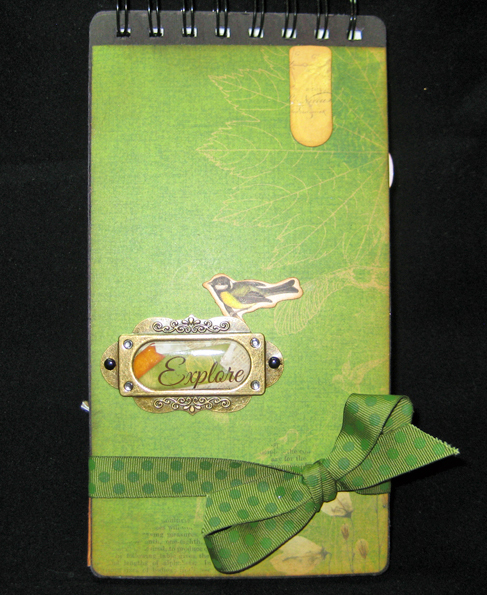 I added the BoBunny double dot ribbon By using Xyron’s High Tack Adhesive Dots to the back cover and pressing the ribbon in place. 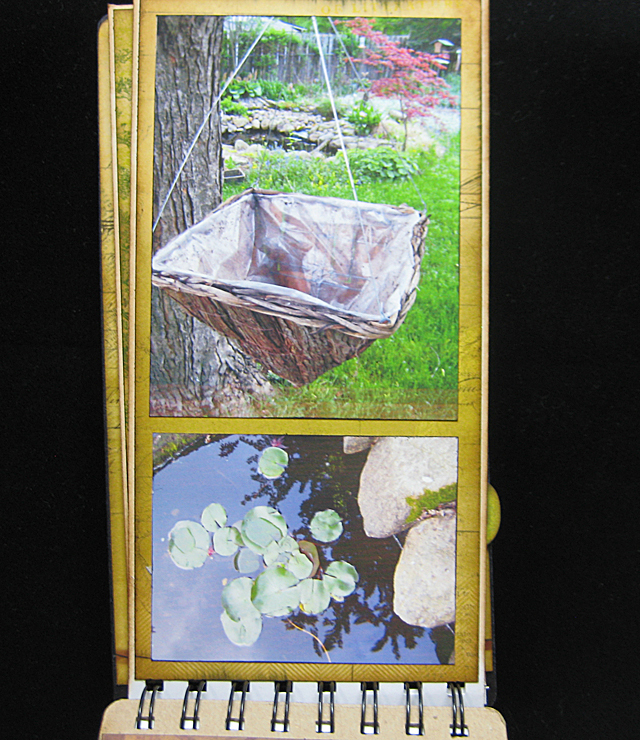 It keeps the garden journal closed by tying a simple bow. For even more ideas using Xyron and BoBunny be sure to visit the Xyron and BoBunny blogs. I love your mini. Your back yard is awesome… So many Beautiful elements. I love all of your details. Thanks, Sandy! Rampant weed takeover is usually where my garden stands. Love this book! I had a similar idea to keep track of the varieties of veggies we plant this year so we can buy them again next year. I LOVE this paper line. Already bought some for myself, too! Thank you! I know, garden record keeping is so hard. You buy the stuff with good intentions on saving receipts and plant stakes but they always seem to get lost. I’m really hoping this will help. What a wonderful idea, a wonderful mini and a great way to keep track of those receipts!